University of Scranton President Rev. 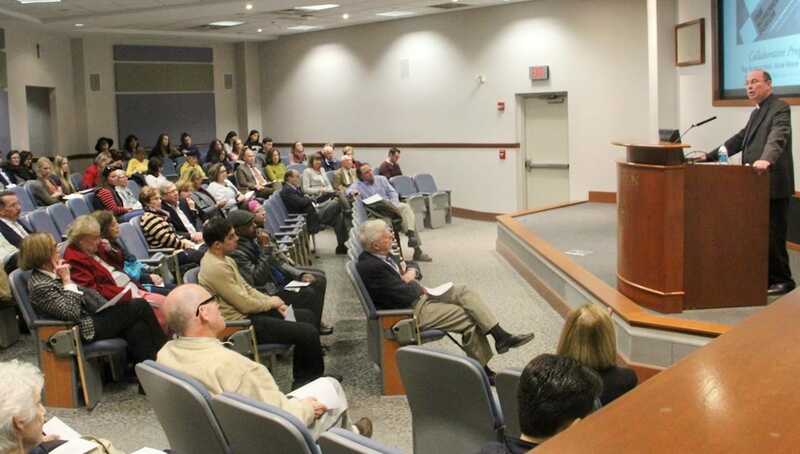 Scott R. Pilarz, S.J., discussed “The Humanities: Now More Than Ever” at an Oct. 18th lecture presented by Schemel Forum in collaboration with the University’s Office of the President. “I do not think it is an overstatement to claim that the role of the humanities and liberal arts in the contemporary university is the most pressing issue facing the president of any University, especially a Catholic and Jesuit University,” said Rev. Scott R. Pilarz, S.J., president of The University of Scranton at a talk presented by the Schemel Forum in collaboration with the Office of the President. Father Pilarz presented “The Humanities: Now More Than Ever” at the lecture held on Oct. 18 on campus. “It is obvious, as it has been for some time, that humanities and liberal arts are on the run across the landscape of American higher education and, in fact, American culture at large,” Father Pilarz said. Humanities and liberal arts classes have been decreasing in most colleges and universities across America, according to Father Pilarz. He made a case for important role the humanities and liberal arts play in higher education by first referencing the history of St. Ignatius Loyola. Ignatius found this rounded education at the University of Paris and lived in Paris for seven years. Father Pilarz discussed the two educational institutions the Jesuits used: the college and the university. This was the basis for the first Jesuit schools that allowed students to engage more in their classes, according to Father Pilarz. This gave Jesuit students, who went to these schools, a desire to take part in their community after education. “Out of the schools, Jesuits came to understand themselves to have a role the shaping of culture,” said Father Pilarz.